CONTENTS: (i) A power point presentation with a range of French native speaker sound files attached to every item of language with animation designed to support both learners and presenters: Starter: Locating France & England; Screens 3-4: Lesson objective and key concept: How greetings change in different countries; Screen 5:Presenting dinosaur character saying hello & goodbye; Screen 6: Presenting four more greetings with colourful dinosaur pictures; Screen 7: Two characters presenting how to say your name. 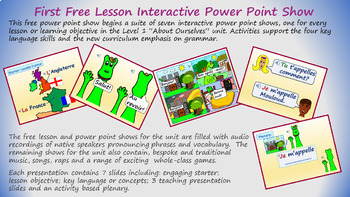 Plenary: Colour supportive template for pupils to introduce themselves; (ii) FREE lesson plan with screen by screen guidance and fun activity suggestions on how to present the show to pupils including a complete French/English vocabulary for the whole of the Level 1 About Ourselves Unit with grammar notes; (iii) FREE b/w illustrated worksheet with 3 differentiated tasks that has been directly linked to the main body of the power point show. 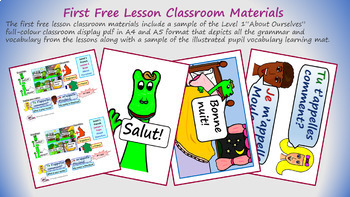 (iv) FREE set of 10 flashcards and FREE A5 pupil vocabulary learning mat covering all the language and expressions in the lesson. 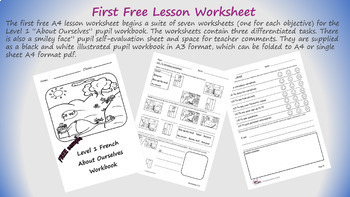 (v) FREE Level 1 MFL Primary KS2/3 French work scheme detailing the other objectives in the unit and where the lesson falls in the teaching scheme. 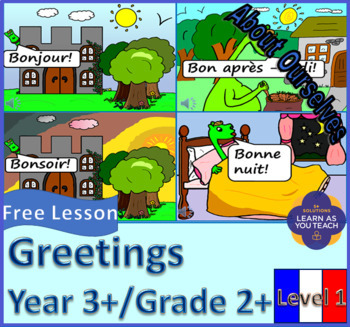 Learnasyouteach French is a unique Primary/ KS2 (KS3 SEN) French scheme designed to empower busy primary teachers, teaching assistants, parents or home educators, (seeking to deliver outstanding French curriculum to KS2 or KS3 less able pupils) learn French alongside the pupils they are teaching. It is also really useful for busy specialist French teachers too! Enjoy!